Solving a new problem often requires rethinking what you’re doing. The HMW (How Might We) questions is sometimes the question that resets a team’s group-mind to backup and take an alternate, and importantly, more productive path. This article lists step-by-step how to tackle the really tough problems with maximum effectiveness. Getting a team to reframe a problem as an opportunity is often the key to success. Step 1: Problem Finding literally consists of finding or anticipating problems and opportunities. The result is a continuous flow of new, present and future problems to solve, changes to deal with and capitalize on, and opportunities for improvement for the organization.  Step 2: Fact Finding consists of deferring convergence and actively gathering information potentially related to a fuzzy situation, and then evaluating and selecting those facts most likely to be helpful in developing a set of fruitful, advantageous problem definitions in the next step. Step 3: Problem Definition consists of first using divergence to convert the key facts the group selected into a wide variety of creative “how might we?” challenges, and then selecting one (or a few) which seem most advantageous to solve. This step is about making sure the group is asking the right questions and that it comes up with the best definitions of the problem. Step 4: Idea Finding consists of deferring convergence while actively creating large number of potential solutions to the target problem definitions, and then converging smaller number of potentially good solutions for evaluation. Step 5: Evaluation and Selection consists of open-mindedly generating a wide variety of criteria potentially useful for making an unbiased and accurate evaluation of the potential solutions, and then selecting and applying the most significant criteria to decide which possible solutions are the best to take forward towards implementation. This stage recognises that problem solving does not end with the development of a good solution. Unless the solution is skilfully prepared for implementation, and it implementation skilfully executed, the problem solving will not have been successful. How to gain support for risking change, how to build commitment to plunge into unknown waters, how to tailor a solution for adaptation to specific circumstance, and how to follow-up to ensure permanent installation of the new change, is a significant, creative venture of its own. Step 6: Action Planning involves thinking up specific action steps which will lead to a successful installation of the new solution. Step 7: Gaining acceptance recognises that the best laid plans can be scuttled by resistance to the new changes involved. This step looks at the ways ownership in the solution can be generated, people can be shown that the solution benefits them, and potential problems caused by the solution can be minimized.  Step 8: Action Taking action recognizes that the actual doing of an action step is an integral part of the decision making and problem solving process, and not to be taken for granted. No matter how carefully thought out the specific steps in a plan of action, it still remains to do the steps. This step recognizes the need to “get on with it” and learn from taking action.